I've ran several PH cycles previously and this will be my 3rd 3 week cycle of M1T. On my first cycle I managed to keep 14lbs lean mass and 12lbs on the second cycle so it will be interesting to see what I keep this time around. If I keep 9-10lbs then i'll be happy. I'll be running 15mg per day, maybe 23mg on training days but i'll wait and see. I was going to stack it with 40mg Trenevar per day but last time I ran Trenevar the sides were terrible. Night sweats, lack of sleep and also vision disturbances giving the effect of a migraine. After speaking to people, for the gains I may make in size i'll be running the M1T solo. I'm 42 years old and been training for 8 years, 5 years seriously. 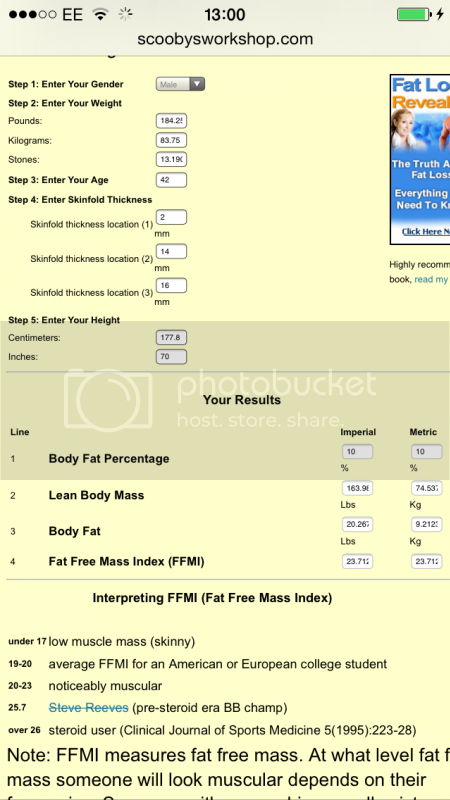 Starting stats are: 184.25lbs @10%BF measured with calipers. To try and keep it lean i'm going around 300-400cals above maintenance at least for the first week and then be prepared to increase them to 500-600cals after the second week. 85kg total plus the weight of the bars, whatever they weigh. I'll never see 85kg per dumbbell lol. Out of interest how tall are you? Fairly short mate, just under 5ft 10ins. 42.5kg dumbells - that's your final weight, there is no "and the weight of the bar" - or are you using screw on types? Btw - what's a forearm nodule? Just noticed your skinfold measurements - are you sure these are right? 2mm for chest with 14mm for abdominal/quads seems an odd ratio? I'm using screw on types mate. I have a small gym in my house, basic but it's got everything I need. In fact I've never once stood foot in a gym! Nodules are fatty deposits that can grow to the size of a golf ball. When I lose fat they get smaller and when I put fat on they get bigger. Can be slightly painful at times but not worth getting them removed. I've also got a couple on my right lower back which are quite big. Don't know if it's an age thing or whether I just store fat around my middle/lower body but whichever way i've got quite a large gut compared with my chest anyway. Looks slightly odd I have to admit because my arms have veins popping out of both biceps and forearms. Suppose can't change genetics unfortunately :(. Day 4: 189.6lbs so up 5.5lbs already in 4 days but I have just come out of a 5 week cut. Weight is each DB not total. I'll be going heavier on the barbell curls on Friday and maybe hammer curls. Chest/Shoulder day on Wednesday. No real sides to report as yet on 15mg per day. My sleep pattern is good so far, maybe a slight bit of lethargy but nothing major. Triceps make up more of your arm mass than biceps so why so little work on the tri's? I feel as though they get hit enough from my chest/shoulder days. I do arms and chest/shoulders twice per week. Then I would replace skulls with dips. More bang for your buck. I feel my tris get a better hit from chest day than my bis do from back, so I'm with you on that. I've done those before. :-) Good stuff. I may re-implement them. Good idea. This... Dips for the win! Dips... when would you do these - Chest day or Shoulder/Tri day?